“By this letter, I will describe the situation of the Catholic schools in my diocese of DASSA-ZOUMÈ. In light of the overcrowding in our classrooms, we desperately need to expand; I will indicate the areas that are in most need of relief as well as provide you with an estimate of the financial aspects of the project. The Diocese of DASSA-ZOUMÈ is one of the largest diocese in the Republic of Bénin, recently created June 10TH in 1995. It covers a vast area of thirteen thousand (13 000) square kilometres, with an approximate population of six hundred and fifty thousand (650 000). This area consists of four major different ethnic groups. It is located in the Province of Collins with a large growing proportion of Catholics which consists of sixty per cent of youth. The Diocese of DASSA is a rural and poor area and surrounded by many other dioceses. The Diocese of DASSA is a crossroads diocese, which unfortunately lacks infrastructure such as water supply to satisfy basic human needs. in our diocese of DASSA-ZOUMÈ IN Bénin are in deplorable condition giving students a poor learning environment. Hence, the children and youth lack access to an adequate basic education because they have no access to quality schools. Without having a guided sense of responsibility, they are vulnerable and could be targeted by jihadists. Catholic schools are renowned for their quality education and consequently are highly sought after. The population prefers to register their children in a Catholic school when they are available. 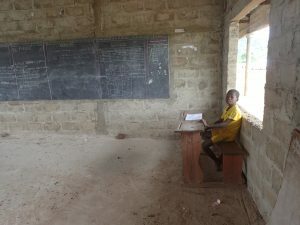 Lacking the financial means, the school administrator in the Diocese of DASSA-ZOUMÈ is unable to build enough classrooms to satisfy the current demands, pay teacher’s salaries, provide suitable settings for play areas, access to libraries and computer labs for the student population. We cannot continue to let the children fend for themselves. We need to teach them how to become responsible citizens through quality education. More than 90% of the population of this area live below the poverty line. In this zone, there is no infrastructure that adequately provides a quality education for our children. We presently do not have enough space to realize our project. There are public schools in the area, but they do not provide a satisfactory modern education. Our Catholic schools definitely offer a better-quality education and can address the literacy problems as well as build adequate and proficient structural competency that is lacking in our country. Our ambition is to educate our youth so that they are not seduced by jihadists and are not subjected to child labor. Our quality education will have a Christian emphasis. It will improve literacy levels and give our students a sense of respect in regard to human dignity to the benefit of our society. To accomplish this project, the bishop of DASSA-ZOUMÈ, the pastoral agents of our diocese and the people who stand to benefit from this project will all collaborate to ensure its success. Because we are a young diocese, we would like to integrate local cultural sports as part of our educational program to entice the young population to school and improve our chances of success. The project properties will be legally owned by the Diocese of Dassa-Zoumè. The infrastructure that we intend to build will be mostly powered by solar panels and supplemented by electricity. Wells will be dug to supply potable water. We will use septic tanks to treat waste and dig pits for local waste. The materials used for construction will mostly consist of cement, sand and gravel. A contractor will oversee the construction. In order to be self-sufficient in the future, we are taking measures to assume full responsibility for the continuation of this project. After five years the evaluation of the project will provide a better assessment of the results achieved. The scholastic tuition fees will in large part cover the ongoing costs of the upkeep of the school furnishings and any necessary future repairs. In the event of a financial deficit, the diocese will be responsible for any building maintenance. 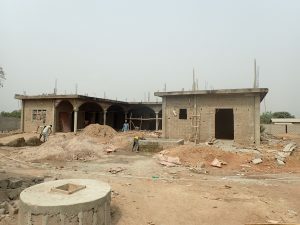 This is why I come to you with this very particular project for the construction of schools in the Diocese of DASSA-ZOUMÈ, BÉNIN. We truly hope that our friends will generously support this important project and will deem this project worthy of being a main priority given to help churches in distress. Write in the memo: Bishop François G. GNONHOSSOU and mail it to : 23 Bliss Ave. Tenafly, NJ 07670. Also you can donate online.